Oaks Elan Darwin Season Special Offer, From USD65. Oaks Elan Darwin Season Special Offer, From USD65 Oaks Hotels & Resorts, Australia. Visiting Darwin in the green season is an experience like no other, the waterfalls of Kakadu and Litchfield are flowing, the fish are biting, and the wildflowers are in bloom. It's a rewarding time to explore the Top End with plenty of wildlife to see, no crowds to fight and unbeatable prices, making it more accessible than ever. Sale Dates: Now until 31 March 2019. Book Now. Green Season Special, From USD80!! Green Season Special, From USD80 at Oaks Cable Beach Sanctuary Oaks Hotels & Resorts, Australia. Visiting Broome in the wet season is an experience like no other, the sky lights up in a spectacular display as the storms roll in, the fish are biting in the Indian Ocean, and the nearby gorges of the Kimberleys are swelling. It's a rewarding time to explore with plenty of wildlife to see, no crowds to fight and unbeatable prices. If you're a WA local its a fantastic time for an affordable weekend escape, enjoy our pools and easy access to Cable Beach! Sale Dates: Now until 28 February 2019. Book Now. Oaks Lagoons Port Douglas Green Season Special, From USD72. Oaks Lagoons Port Douglas Green Season Special, From USD72 Oaks Hotels & Resorts, Australia. Visit Oaks Lagoons and enjoy great savings, stay a minimum of 2 nights in our Hotel Spa Room with your very own spa from as little as $99 a night. Sale Dates: Now until 28 Feb 2019. Room Types: Hotel Spa. Book Now. Up to 25% Off + Late Check Out Oaks Hotels & Resorts, Australia. Save Up to 25% Off + Late Check out Oaks Hotels & Resorts, Australia. Make the most of your 2-night stay in a 2 bedroom apartment with 25% OFF, late check out, a gourmet snack pack and free WiFi. Book Now. Green Season Special - From USD71. Green Season Special, From USD71 + Free Parking and Wi Fi Oaks Elan Darwin, Australia. Visiting Darwin in the green season is an experience like no other, the waterfalls of Kakadu and Litchfield are flowing, the fish are biting, and the wildflowers are in bloom. It's a rewarding time to explore the Top End with plenty of wildlife to see, no crowds to fight and unbeatable prices, making it more accessible than ever. Stay 2 nights at Oaks Elan Darwin in a Hotel Harbour Room from $89 per night or a 2 Bedroom Harbour Room from $199 per night. Includes free parking and Wi-Fi. Romance Package 2018 - From USD106. Romance Package 2018 - From USD 106 + Late check out at Oaks Embassy Oaks Hotels & Resorts, Australia. There's never been a better time to plan an unforgettable romantic getaway with that special someone! Stay at selected Oaks Hotels and enjoy a FREE bottle of sparkling wine, complimentary room upgrade and late 12pm check-out! Romance Package - From USD112. Romance Package, From USD112 + Late Check Out + Room Upgrade Oaks Cable Beach Sanctuary Oaks Hotels, Australia. There's never been a better time to plan an unforgettable romantic getaway with that special someone! Stay at selected Oaks Hotels and enjoy a FREE bottle of sparkling wine, complimentary room upgrade and late 12pm check-out! Book Now. Romance Package - From USD184. Romance Package, From USD184 + Late Check Out + Room Upgrade at Oaks Plaza Pier Oaks Hotels & Resorts, South Australia. There's never been a better time to plan an unforgettable romantic getaway with that special someone! Stay at selected Oaks Hotels and enjoy a FREE bottle of sparkling wine, complimentary room upgrade and late 12pm check-out! So Book Now. February Sale, Up to 15% Off at iStay Precinct Oaks Hotels South Australia. February Sale, Up to 15% Off at iStay Precinct Oaks Hotels South Australia. Stay 3 nights and SAVE 15% at iStay Precinct. Plus MyOaks members can enjoy an extra 10% off when you enter 'MYOAKS' in the promo code field. Book Now. Up to 15% Off at Oaks Aspire Oaks Hotels Queensland, Australia. February Sale, Up to 15% Off at Oaks Aspire Oaks Hotels Queensland, Australia. Stay 3 nights and SAVE 15% at Oaks Aspire Apartments. Plus MyOaks members can enjoy an extra 10% off when you enter 'MYOAKS' in the promo code field. Book Now. 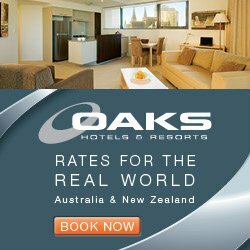 Save up to 20% at Oaks on Market Oaks Hotels Melbourne, Australia!! February Sale 2018, Save up to 20% at Oaks on Market Oaks Hotels Melbourne, Australia. Stay 4 nights and SAVE 20% at Oaks Rivermarque. Plus MyOaks members can enjoy an extra 10% off when you enter 'MYOAKS' in the promo code field. Book Now. Stay For Minimum 4 Nights & Save Up to 20% OFF!! Save Up to 20% at Oaks Hotels & Resorts, New South Wales, Sydney when you stay 4 nights or more at selected hotels. Participating Hotels: Oaks Goldsbrough. Oaks Hyde Park Plaza. Oaks on Castlereagh. Terms & Conditions: Offer valid until 30 June 2016. Stays for 3 Nights or More and Get Up to 15% Off!! Stays for 3 Nights or More and Get Up to 15% Off Oaks Hotels & Resorts Brisbane, Queensland. Book for 3 nights or more at Oaks Hotels & Resort, Queensland and get up to 15% off. The room caters for a maximum of 3 adults, and 2 children but cannot exceed 2 guests in total. Offer includes 30 minutes continuous use of free internet per day. Participating Hotels: Oaks 212 Margaret. Oaks Casino Towers. Oaks Charlotte Towers. T&C: Offer valid until 30/06/16. Subject to availability. Term and conditions may apply depending up on participating hotels. Get Up to 20% Off Oaks Hotels & Resorts Regional, Queensland. Book now and get up to 20% off on your 3 or more nights stay at Oaks Hotels & Resort, Queensland. The room caters for a maximum of 3 adults, and 2 children but cannot exceed 2 guests in total. Offer includes 30 minutes continuous use of free internet per day. Participating Hotels: Oaks Aspire. Oaks Mon Komo. Oaks Gateway on Palmer. Oaks M on Palmer. Oaks Seaforth Resort. Oaks Oasis. T&C: Offer valid until 30/06/16. Subject to availability. Term and conditions may apply depending up on participating hotels. Cool Down With Hot Rates & Cold Beer in Broome From Just $109 Per Night, Western Australia. Cool Down With Hot Rates & Cold Beer in Broome From Just $109 Per Night, Western Australia. Oaks Hotels & Resorts has released a selection of Hot Rates & Cold Beer deals at its popular resort properties: Oaks Broome and Oaks Cable Beach Sanctuary. Including accommodation in a spacious one bedroom apartment or contemporary studio. Two bottles of icy cold local beer on arrival. T&C: Minimum Two nights stay. Staying Period: 1st November 2015 until 22nd June 2016. Booking Period: Now until 22 June 2016. Book Now. Get up to 20% Off Oaks Hotels and Resorts, Melbourne, Victoria. Central Melbourne Hotel Apartment Accommodation with Yarra River Views. Enjoy full buffet breakfast for 1 person. The room caters for a maximum of 2 adults, and a maximum of 1 child but cannot exceed 2 guests in total. Rates are for 2 guests. T&C: Minimum 7 nights stay. Booking and staying period: Now until 28th February 2016. Book Now. Get Up to 15% OFF Oaks Mon Komo Queensland. Up to 15% OFF Oaks Mon Komo Queensland. Up to 15% off when you stay 3 nights or more. Stylish, self contained accommodation on the tranquil seaside location of Red cliffe. T&C: Minimum 3 nights stay. Booking Window: now untill 31st Dec 2015. Booking Window: now untill 31st Dec 2015. Book Now. Save Up To 20% Off Booked in Advance!! Save Up To 20% Off when booked in advance Oaks Liwa Heights, Dubai. Package details: Modern Dubai hotel apartment accommodation, perfect for corporate and leisure travellers. T&C: Booking Window : now untill 31 Dec 2015. Stay Window : now untill 31 Dec 2015. Book Now. Stay 3, Pay 2. Bed & Breakfast Oaks Liwa Abu Dhabi. Stay 3, Pay 2. Bed & Breakfast Oaks Liwa Abu Dhabi. Includes : Free Wi Fi in room. Complimentary buffet breakfast. Daily newspaper delievered to room. Free access to the gym and pool. Late check out at 4 p.m. subject to availability. Airport pick up/drop off service one way Oaks Superior Club Suite only. Two garments washed and pressed per day. A varied breakfast served at the restaurant or in your room. T&C: Booking Window:Now untill 31st Dec 2015. Stay Window:Now untill 31st Dec 2015. Book Now. Get Up To 25% OFF!! Get Up To 25% OFF Oaks Hotels Lagoons, Queensland. Get up to 25% off when you stay 5 nights or more. Situated in Port Douglas, Oaks Lagoons combines deluxe accommodation with a range of leisure facilities. T&C: Minimum 5 nights stay. Booking window: Now until 31 Dec 2015. Stay window: Now until 31 Dec 2015. Book Now. Get Up To 20% Off Oaks hotels and resorts, Melbourne, Victoria. Get Up To 20% Off Oaks hotels and resorts, Melbourne, Victoria. Central Melbourne Hotel Apartment Accommodation with Yarra River Views. Enjoy full buffet breakfast for 1 person. The room caters for a maximum of 2 adults, and a maximum of 1 child but cannot exceed 2 guests in total. Rates are for 2 guests. T&C: Minimum 7 nights stay .Booking window : now until 31st Dec 2015. Staying window : now until 31st Dec 2015. Up to 15% Off Oaks Mon Komo Queensland. Up to 20% OFF When Booked in Advance Oaks Liwa Heights, Dubai. Up to 20% OFF When Booked in Advance Oaks Liwa Heights, Dubai. Package details: Modern Dubai hotel apartment accommodation, perfect for corporate and leisure travellers. T&C: Booking Window : now untill 31 Dec 2015. Stay Window : now untill 31 Dec 2015. Book Now. Stay 3, Pay 2. Bed & Breakfast Oaks Liwa Abu Dhabi! Stay 3, Pay 2. Bed & Breakfast Oaks Liwa Abu Dhabi! Includes : Free Wi Fi in room. Complimentary buffet breakfast. Daily newspaper delievered to room. Free access to the gym and pool. Late check out at 4 p.m. subject to availability. Airport pick up/drop off service one way Oaks Superior Club Suite only. Two garments washed and pressed per day. A varied breakfast served at the restaurant or in your room. T&C: Booking Window:Now untill 31st Dec 2015. Stay Window:Now untill 31st Dec 2015. Book Now. Get Up To 25% OFF Oaks Hotels Lagoons, Queensland. Melbourne: Oaks on Market - Up to 20% Off!! Melbourne: Oaks on Market - Up to 20% Off When You Stay 7 Nights or More.. Package details: Central Melbourne Hotel Apartment Accommodation with Yarra River Views. Minimum 7 nights stay. Book Now. Oaks Liwa Heights Dubai - Up to 20% OFF!! Oaks Liwa Heights Dubai - Up to 20% OFF When Booked in Advance. Oaks Liwa Heights puts you in the heart of the Dubai Jumeirah Lakes Towers, one of Dubai�s most expanding accommodation precincts, offering convenient access to all that Dubai has to offer. Our spacious fully self contained, contemporary designed one and two bedroom apartments offer a comfortable living style. Each apartment includes a fully equipped kitchen, washing machine, dishwasher, direct dial telephones, LCD TV and DVD player, high speed internet, courtyard balcony and are ideally positioned in a waterfront community. Oaks Mon Komo - Up to 15% OFF Queensland. Oaks Mon Komo - Up to 15% OFF Queensland!! Up to 15% Off when you stay 3 nights or more.. Stylish, self contained accommodation on the tranquil seaside location of Redcliffe. Book Now. Stay 3, Pay 2. Bed & Breakfast Abu Dhabi and Dubai Oaks Hotels. Stay 3, Pay 2. Bed & Breakfast Abu Dhabi and Dubai Oaks Hotels. Includes: Free Wi Fi in room. Complimentary buffet breakfast. Daily newspaper delievered to room. Free access to the gym and pool. Late check out at 4 p.m. subject to availability. Airport pick up/drop off service one way Oaks Superior Club Suite only. Two garments washed and pressed per day. A varied breakfast served at the restaurant or in your room. Book Now. Melbourne: Oaks on Market Up to 20% Off! Melbourne: Oaks on Market Up to 20% Off When You Stay 7 Nights or More.. Package details: Central Melbourne Hotel Apartment Accommodation with Yarra River Views. Minimum 7 nights stay. Book Now. Business in the City of Dubai! Business in the City of Dubai. Includes : Complimentary buffet breakfast at El Pasha restaurant. Free High speed Wifi in room and public areas. Daily newspaper in room. Free access to the gym and pool. Late check out at 4 p.m subject to availability. Discounted rates for Airport pick up and drop service arranged at extra cost on request. Two garments washed and pressed per day. Book Now. Stay 3, Pay 2. Bed & Breakfast Abu Dhabi and Dubai! Stay 3, Pay 2. Bed & Breakfast Abu Dhabi and Dubai! Includes : Free Wi Fi in room. Complimentary buffet breakfast. Daily newspaper delievered to room. Free access to the gym and pool. Late check out at 4 p.m. subject to availability. Airport pick up/drop off service one way Oaks Superior Club Suite only. Two garments washed and pressed per day. A varied breakfast served at the restaurant or in your room. Book Now. Oaks Mon Komo - Up to 15% Off Queensland. Up to 15% off when you stay 3 nights or more. Stylish, self contained accommodation on the tranquil seaside location of Redcliffe. Book Now. Oaks Lagoons Port Douglas. Situated in Port Douglas, one of Tropical North Queensland�s most desired holiday destinations, Oaks Lagoons combines deluxe accommodation, a range of leisure facilities and easy access to the magical Great Barrier Reef and Daintree Rainforest, making it the perfect holiday destination. Lush gardens and six lagoon style pools surround the resort�s guest accommodation, creating a relaxed and welcoming atmosphere in keeping with the warm, friendly ambience of the region and making it one of the best Port Douglas resorts. Spacious and stylish accommodation options range from hotel rooms with large corner spas, to self contained one and two bedroom apartments complete with fully equipped kitchen and laundry facilities. Oaks Liwa Heights Dubai!! Oaks Liwa Heights puts you in the heart of the Dubai Jumeirah Lakes Towers, one of Dubai�s most expanding accommodation precincts, offering convenient access to all that Dubai has to offer. Our spacious fully self contained, contemporary designed one and two bedroom apartments offer a comfortable living style. Each apartment includes a fully equipped kitchen, washing machine, dishwasher, direct dial telephones, LCD TV and DVD player, high speed internet, courtyard balcony and are ideally positioned in a waterfront community. You can enjoy the onsite facilities, whether you are staying short or long term, they include: swimming pool. gymnasium. squash court. Coffee shop and Restaurant. Oaks Aspire Apartments Ipswich. Located in the heart of Ipswich�s thriving city, the 4.5 star Oaks Aspire leads the away as the premier serviced and self contained accommodation choice for holidaymakers and corporate travellers visiting this subtropical region. Just a stone�s throw from the winding Bremer River and minutes from myriad shopping boutiques, restaurants, cafes and public transport options, Oaks Aspire is the perfect base from which to enjoy the rich history Ipswich is renowned for and its countless sights and sounds. Pay a visit to the nearby Ipswich Art Gallery, enjoy a show at Civic Centre, or pack a picnic and retreat to one of the many green parks and reserves. Oaks Shores Queenstown. Set against the breathtaking Remarkables Mountain Range and boasting immediate Lake Wakatipu frontage, Oaks Shores offers spacious Queenstown apartment style accommodation in New Zealand�s most popular ski town. Our hotel rooms, spacious one, two and three bedroom apartments and stylish four bedroom penthouses are impeccably appointed with luxurious furnishings, quality linen and personal amenities, under floor heating, double glazed windows, 50 inch TV with cable channels, internet access, and most offer gas fireplaces and balconies with views over the lake and mountain ranges. Stay 3, Pay 2. Bed & Breakfast!! Stay 3, Pay 2. Bed & Breakfast!! Includes : Free Wi Fi in room. Complimentary buffet breakfast. Daily newspaper delievered to room. Free access to the gym and pool. Late check out at 4 p.m. subject to availability. Airport pick up/drop off service one way Oaks Superior Club Suite only. Two garments washed and pressed per day. A varied breakfast served at the restaurant or in your room. Book Now. Stay Longer and Save. Oaks Liwa Executive Suites offers 54 units with world class facilities as well as access to superior hotel services. All suites are beautifully decorated with spacious living, sleeping and working areas. In addition to offering you an extraordinary setting, we have the very latest audio visual technology. Our ultra luxurious suites located on Club Floors, embrace our guests in a world of plush comforts and discerning style. You get a feeling of total exhilaration as you relax at Liwa Executive Suites with all the five star services at your fingertips. Each suite contains a separate living area and desk with dual line extension telephone, IDD and PC connections a dedicated line for facsimile machine connection is available on request. Bathrooms are equally spacious and luxurious with delightful attention to detail. Up to 20% off when booked in advance. Book Now. Oaks 212 Margaret Brisbane!! One Bedroom Apartment with full kitchen, laundry and balcony with city views. The room caters for a maximum of 3 adults, and a maximum of 2 children but cannot exceed 3 guests in total. Rates are for 2 guests. Extra guests $44 per night. Includes 30 minutes continuous use of FREE INTERNET per day. Long Stay Accommodation!! Enjoy our unique offer of serviced apartment accommodation, ranging from comfortable studios and hotel rooms with tea and coffee making facilities to spacious and self contained one, two and three bedroom apartments - all fully furnished with full kitchens, and in most cases, laundry facilities - combined with premier onsite leisure and business facilities. Our long term rental accommodation also includes a number of thoughtful in room conveniences to make your stay a memorable and pleasant one, such as reverse cycle air conditioning, TVs with DVD/CD/Bluetooth players and cable channels, alarm clocks, personal safes, wi fi access, ironing equipment and bathroom amenities. Business in the City of Dubai..
Business in the City of Dubai. Includes : Complimentary buffet breakfast at El Pasha restaurant. Free High speed Wifi in room and public areas. Daily newspaper in room. Free access to the gym and pool. Late check out at 4 p.m subject to availability. Discounted rates for Airport pick up and drop service arranged at extra cost on request. Two garments washed and pressed per day. Stay Longer and Save! Oaks Liwa Executive Suites offers 54 units with world class facilities as well as access to superior hotel services. All suites are beautifully decorated with spacious living, sleeping and working areas. In addition to offering you an extraordinary setting, we have the very latest audio visual technology. Our ultra luxurious suites located on Club Floors, embrace our guests in a world of plush comforts and discerning style. You get a feeling of total exhilaration as you relax at Liwa Executive Suites with all the five star services at your fingertips. Each suite contains a separate living area and desk with dual line extension telephone, IDD and PC connections a dedicated line for facsimile machine connection is available on request. Bathrooms are equally spacious and luxurious with delightful attention to detail. Up to 20% off when booked in advance. Stay 3, Pay 2. Bed & Breakfast!! Includes : Free Wi Fi in room. Complimentary buffet breakfast. Daily newspaper delievered to room. Free access to the gym and pool. Late check out at 4 p.m. subject to availability. Airport pick up/drop off service one way Oaks Superior Club Suite only. Two garments washed and pressed per day. A varied breakfast served at the restaurant or in your room. Business in the City of Dubai. Oaks Shores Queenstown!! Set against the breathtaking Remarkables Mountain Range and boasting immediate Lake Wakatipu frontage, Oaks Shores offers spacious Queenstown apartment style accommodation in New Zealand�s most popular ski town. Our hotel rooms, spacious one, two and three bedroom apartments and stylish four bedroom penthouses are impeccably appointed with luxurious furnishings, quality linen and personal amenities, under floor heating, double glazed windows, 50 inch TV with cable channels, internet access, and most offer gas fireplaces and balconies with views over the lake and mountain ranges. Oaks 212 Margaret Brisbane! One Bedroom Apartment with full kitchen, laundry and balcony with city views. The room caters for a maximum of 3 adults, and a maximum of 2 children but cannot exceed 3 guests in total. Rates are for 2 guests. Extra guests $44 per night. Includes 30 minutes continuous use of FREE INTERNET per day. Oaks Aspire Apartments Ipswich! Located in the heart of Ipswich�s thriving city, the 4.5 star Oaks Aspire leads the away as the premier serviced and self contained accommodation choice for holidaymakers and corporate travellers visiting this subtropical region. Just a stone�s throw from the winding Bremer River and minutes from myriad shopping boutiques, restaurants, cafes and public transport options, Oaks Aspire is the perfect base from which to enjoy the rich history Ipswich is renowned for and its countless sights and sounds. Pay a visit to the nearby Ipswich Art Gallery, enjoy a show at Civic Centre, or pack a picnic and retreat to one of the many green parks and reserves. Oaks Lagoons Port Douglas! Situated in Port Douglas, one of Tropical North Queensland�s most desired holiday destinations, Oaks Lagoons combines deluxe accommodation, a range of leisure facilities and easy access to the magical Great Barrier Reef and Daintree Rainforest, making it the perfect holiday destination. Lush gardens and six lagoon style pools surround the resort�s guest accommodation, creating a relaxed and welcoming atmosphere in keeping with the warm, friendly ambience of the region and making it one of the best Port Douglas resorts. Spacious and stylish accommodation options range from hotel rooms with large corner spas, to self contained one and two bedroom apartments complete with fully equipped kitchen and laundry facilities. Oaks Mon Komo - Save Up to 15% OFF!! Oaks Mon Komo - Save Up to 15% off when you stay 3 nights or more. Stylish, self contained accommodation on the tranquil seaside location of Redcliffe. Book now. Oaks M on Palmer - Take Up To 15% OFF!! Oaks M on Palmer - Get Up to 15% off when you stay 3 nights or more. Affordable quality accommodation in Townsville delivering contemporary, self contained apartments. Book Now. Oaks CasinoTowers - Up to 15% Off Say 3 Nights or More..
Oaks CasinoTowers Up to 15% off when you stay 3 nights or more.. Package details: Minimum 2 night stay. 4 1/2 star apartments in Brisbane sinner City. Book Now. Melbourne: Up to 20% OFF Stay 7 Nights or More..
Melbourne: Oaks on Market Up to 20% off when you stay 7 nights or more. Central Melbourne Hotel Apartment Accommodation with Yarra River Views. Minimum 7 nights stay. Book now. Get Up to 25% OFF Oaks Lagoons! Get up to 25% off when you stay 5 nights or more. Situated in Port Douglas, Oaks Lagoons combines deluxe accommodation with a range of leisure facilities. Take Up to 15% OFF Oaks Oasis!! Get up to 15% off when you stay 3 nights or more. Family friendly Sunshine Coast accommodation, near the beach at Caloundra. Book now. Up to 20% OFF When You Stay 7 Nights or More Oaks on Collins..
Up to 20% OFF When You Stay 7 Nights or More Oaks on Collins.. Package includes: Minimum 7 nights or more. New York style Hotel Apartment Melbourne Accommodation in the heart of the CBD. Romantic Spa, Swim & Play Package Oaks Lagoons!! Romantic Spa, Swim & Play Package Oaks Lagoons!! Hotel Spa Room balcony, tea and coffee making facilities, DVD player, ceiling fans & satellite TV. Relax and unwind in your secluded corner spa on the balcony or swim in your own exclusive plunge pool. No minimum stay restrictions. Book Now. Buffet Lunch Oaks on Collins!! Buffet Lunch Oaks on Collins!! One of the best hotels weve gone into on our recent trip to Australia. Oaks on Collins street was pretty central to Flinders Station and Melbourne train and bus station. It was walking distance to a lot of attractions in the middle of town. 1st Floor Restaurant & Bar. Fridays 12.00pm 2.30pm. Only $20 per person. Present flyer on arrival to receive 20% off all drinks. Book Now. Bed & Breakfast Oaks on Collins! Bed & Breakfast Oaks on Collins! Hotel Spa with king bed, spa bath, tea and coffee making faciilties and small fridge. Full buffett breakfast for 2 guests daily, a bottle of sparkling wine and chocolates on arrival. Un serviced rate, minimum 2 night stay. Book Now. Stay & Play Package Cypress Lakes Resort! Stay & Play Package Cypress Lakes Resort! 1 Bedroom Villa package includes a round of 18 hole golf with buggy hire for 2 guests per day. Accommodation is in a One Bedroom Villa featuring a King sized bed, ensuite, private balcony, kitchenette, dining and living room with entertainment unit and air conditioning. 2 bedroom Villa package Includes a round of 18 hole golf with buggy hire for 4 guests per day. Accommodation is in a Two Bedroom Suite featuring two bathrooms, private balcony, full kitchen, spacious dining and living room and air conditioning. Book Now. Brisbane Art Experience Package Oaks Hotels & Resorts! Brisbane Art Experience Package Oaks Hotels & Resorts! Enjoy 2 tickets to the Cai Guo Qiang Summer Exhibition at QAGOMA and accommodation in a self contained one bedroom apartment. Min 2 night stay. Oaks Casino Towers. Oaks Charlotte Towers. Book Now. Cypress Lakes Resort Bed & Breakfast!! Cypress Lakes Resort Bed & Breakfast!! One Bedroom Villa accommodation includes a full buffet breakfast for 2 guests daily. Villas feature a King sized bed, ensuite, private balcony, kitchenette and dining and living room with air conditioning and broadband internet fee applies. Two Bedroom Villa accommodation includes a full buffet breakfast for 4 guests daily. Accommodation in a Two Bedroom Villa over two levels featuring two ensuites, private balcony, full kitchen, spacious dining and living room, air con and broadband internet access fee applies. Book Now. Art Experience Double Package Oaks Hotels & Resorts!! Art Experience Double Package Oaks Hotels & Resorts!! Enjoy 2 tickets to QAGOMA Summer Exhibitions California Design & Cai Guo Qiang and accommodation in a self contained one bedroom apartment. Min 2 night stay. Available from February 10th. Oaks Charlotte Towers. Oaks Casino Towers. Art Experience Package Oaks Hotels & Resorts!! Art Experience Package Oaks Hotels & Resorts!! Enjoy 2 tickets to the Cai Guo Qiang Summer Exhibition at QAGOMA and accommodation in a self contained one bedroom apartment. Min 2 night stay. Oaks Casino Towers. Oaks Charlotte Towers. Gourmet Escape Package: Oaks Lagoons. Gourmet Escape Package: Oaks Lagoons. Package details: Gourmet Escape Package. Minimum 3 night stay. Hotel room with large private corner spa on balcony. Including alarm clock, broadband, dvd player, ceiling fans, satellite TV and balcony/courtyard. The room caters for a maximum of 2 adults, and a maximum of 1 child but cannot exceed 2 guests in total. Stay & Play Package Oaks Oasis!! Stay & Play Package Oaks Oasis!! Hotel Family. 2 rounds of golf at Pelican Waters Golf Club 18 holes including a motorised cart.Tee times need to be checked with the pro shop directly prior to booking on 07 5437 5000. Un serviced rate, minimum 2 night stay. Romantic Spa, Swim & Play Package Oaks Lagoons!! Hotel Spa Room balcony, tea and coffee making facilities, DVD player, ceiling fans & satellite TV. Relax and unwind in your secluded corner spa on the balcony or swim in your own exclusive plunge pool. No minimum stay restrictions. Romance Package Oaks Oasis!! Hotel King Spa with king bed, spa bath, tea and coffee making facilites and small fridge. Full buffett breakfast for 2 guests daily, a bottle of sparkling wine and chocolates on arrival. Un serviced rate, minimum 2 night stay. Oaks Hotels & Resorts! Oaks Hotels & Resorts Australia offers an extensive range of more than 40 resorts, retreats and hotels across Australia, New Zealand and the United Arab Emirates.